I’m not sure how it is for you, but I always seem to have problems packing for short trips, especially when I travel by plane on one of the low-cost airlines. Somehow I have a million “What ifs” on my mind packing entirely too much. In the end, it is always better to be safe than sorry, right? However, with all the restrictions and extra costs for extra luggage, the last thing you want to do is over pack your luggage. If you do, you will pay extra or must repack or leave it behind. First things first. You can carry a small number of liquids on the plane, so make sure you pack your toiletries accordingly. Perhaps the best travel by air advice is to fill shampoo and soap in smaller containers or buy travel-size containers. Since you will pack everything in one bag make sure you put these kinds of liquids together in a small plastic bag to avoid any possible leakage in the bag, but also to be able to take them out and show them at the airport. 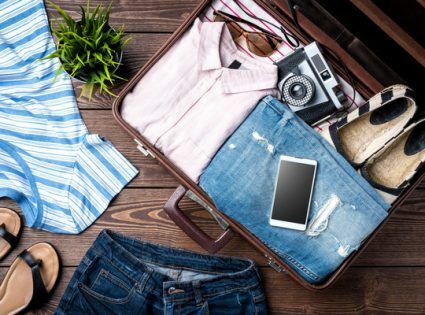 Clothes are usually what takes up most of the space in your travel luggage. I would like to always be prepared for any kind of occasion and weather and if I could I would pack my whole closet anywhere I go! Pack versatile items that you can mix and match. A good pair of jeans or black pants can be dressed up or down with according to top, accessories, and shoes. Instead of an extra sweater that will take up more space pack a big scarf that you can also wear around your shoulders when it gets a little chilly. For colder seasons pick one coat or jacket that will work with anything you wear and have it ready to wear on the plane. Try to stick to two pairs of comfortable shoes. But comfortable shouldn’t mean that you couldn’t wear them for an occasion for which you would have to dress up. The pair you are wearing during the flight and one extra in your bag should be enough. Lastly, so save space roll up your clothes and maybe stuff socks in the extra pair of shoes you are bringing. Lastly, just remember that should you be forgetting anything don’t forget that you will probably be able to find anything important you forgot before you left at your eventual destination whether you stay in apartments in Budapest or New York.